Mary MacADNski: I loved the two distinct animals crossing. 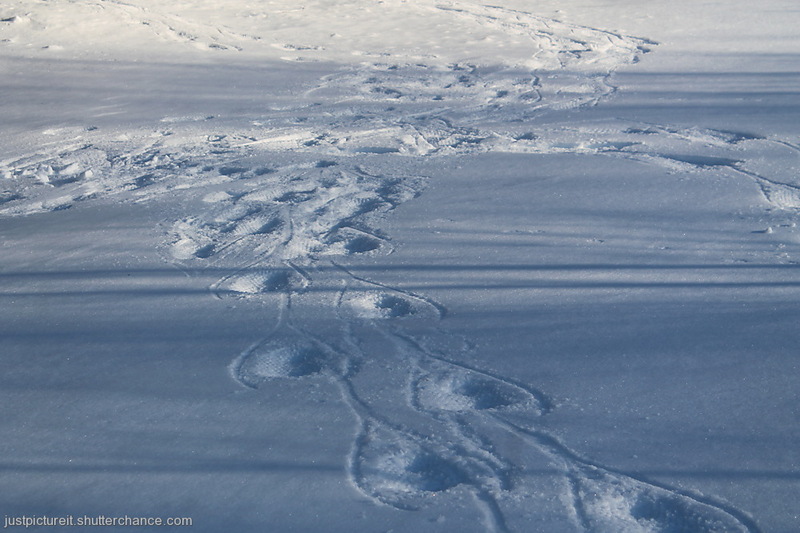 Mary MacADNski: Loved seeing the animal tracks. No Polar Bears in PEI, I suppose? Mary MacADNski: Not anywhere near that region, Ray. Difference in the photo's and in the music! What a lovely place! The bottom picture is wonderful. I love these tracks. Wonderful pictures from today and yesterday. Snow, I know is not always nice, but sure adds to nice pictures. Mary MacADNski: Book your ticket. It is still snowing here for a while. I like the virgin, untouched snowscape. Mary MacADNski: I can see all I want of that in my area. Two more very fine snow shots Mary. I often wonder just how many dozen different recordings have been made of Unchained Melody, I think every possible nuance of expression must have been tried by now. Mary MacADNski: The George BENSON HAS BEEN MY FACORITE SINCE i BOUGHT THE ALBUM IN THE LATE 70's, early 80's. Sorry about that, Brian. Were you tempted to make your own patterns in the pristine snow in the top image Mary? Mary MacADNski: Tuesday's shots and this should have been posted together. I may go do that now. Mary MacADNski: I love George Benson's version beyond all. It is a great song. As much as I enjoy seeing animal prints in the snow, I like t see virgin snow, too.